Home > Dollars & Sense, Social Issues, The Body Politic	> The real cause for Solid Energy mass redundancies? 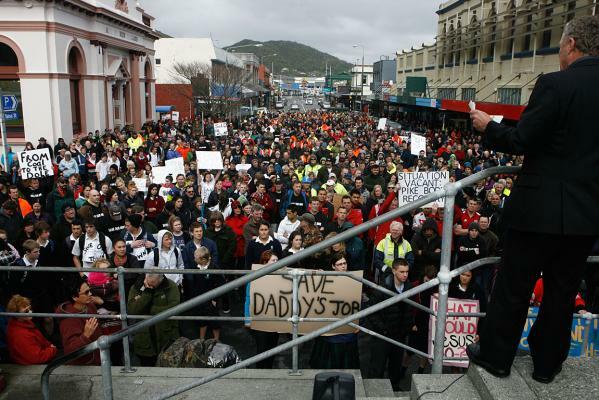 4 September 2012: Citizens of Greymouth, protesting at impending job losses from Solid Energy mines. By 29 August, Solid Energy announced 140 jobs to go and a suspension of operations at Spring Creek mine on the West Coast. A further 123 jobs were to be cut at Huntly East Mine in Waikato. No one can rationally argue that job losses on this scale, with ensuing loss of wages and company spending, will have a devastating impact of the West Coast economy. The losses will cause incalculable harm. Solid Energy has attempted to justify redundancies by pointing to a drop in international coal prices; a fall in demand from China; and a $40.2 million “loss” in profits. Two of the above reasons have a degree of merit – the third reason has been mis-represented to the public. Coal prices have indeed dropped. From a recent high of NZ$185.47 per metric tonne in January 2011 – to NZ$113.33 at the end of July, this year. This is a drop of NZ$72.14 per metric tonne. That figure of 18 redundancies is in stark contrast to the 360 redundancies this year. ” Globally diversified miner Anglo American PLC said the global thermal coal market looks bearish in the short term, partly due to displacement of U.S. coal demand by shale gas and an economic slowdown in China, but it is still an attractive market over the medium to long term. “In the short term, we will have a bearish market,” Norman Mbazima, chief executive of Anglo American’s Thermal Coal division, told analysts at a seminar. But “there is very good demand outlook for coal. Coal will continue to be the mainstay of electricity production in the world and this will underpin good prices into the future,” he said. ” Coal demand is also expected to be fragile amid a weak economic outlook for the rest of the year. A Reuters poll forecasts this year to see the slowest full-year of economic growth since 1999 as demand for China’s factory goods falls due to the debt crisis in its biggest customer the European Union. “The coal market will remain challenging,” said Ivan Lee, a coal analyst at Nomura Bank. Chinese coal prices can only rebound if demand recovers considerably, which requires the manufacturing purchasing managers index (PMI) to rise above 50, economic growth to climb above 8 percent and power plants’ coal stocks to fall by half, Lee said. The data, however, is not encouraging. The latest PMI showed China’s manufacturing sector contracted at its sharpest pace in nine months in August, with the index falling to 47.8 from 49.3 in July. Even if China decided it needs more coal, which is unlikely, it will not seek it abroad as imports have become more expensive than domestic supplies, traders said. 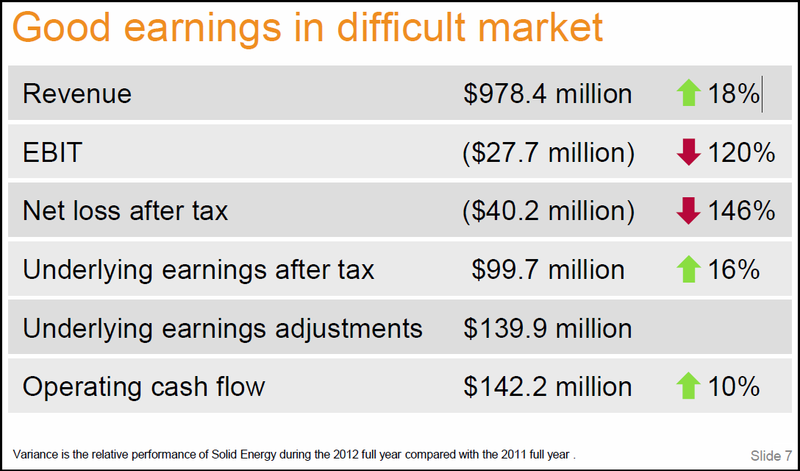 Whilst this may impact on Solid Energy’s profits (as compared to this year and 2011), Solid Energy’s viability does not seem threatened. The only threat to Solid Energy is it’s saleability. The more profit Solid Energy makes – the higher the share price when it is floated on the Stock Exchange. By contrast, the lower the the profit, the lower the share price. Which may explain Bill English’s comment in the media item below, “English – Solid Energy not ready for sale”. Any “loss” by Solid Energy is there a paper loss only; an accounting mechanism to revalue assets. It’s profits remain unchanged. Solid Energy therefore cannot rely on an imaginary “loss” to justify redundancies – because there was no loss. By contrast, there were only 18 redundancies in November 2009, even though the price per metric tonne was similar. Despite Elder’s protestations to the contrary, this blogger has no doubt whatsoever that Solid Energy employers and the entire West Coast are paying dearly for National’s privatisation agenda. There are some very dirty back room deals going on, and the wafting smell ain’t methane escaping from West Coast mines. The entire country is paying, Frank, apart from a small number who will have their snouts in the corporate welfare trough. Makes sense to me. Im conflicted on this issue. Its tragic on many levels, lost jobs, costs to families, loss of community….however, the Chinese for example have bunkered billions of tonnes of bright coal against future demands and pricing and coal really is primitive technology in this century. It is almost redundant or should be as one of the dirtiest, most dangerous ways of generating power. Take a look at whats left of the Arctic Circle and tell me we need to dig more coal? Ralph – That thought ran through my mind as well, as I wrote that piece. I guess we can say it’s a separate (but ultimately related) issue, and what we’re seeing is National doing back-room deals to make Solid Energy saleable. In which case we can expect coal mining become a 100% commercial activity without regard to CO2 emissions.